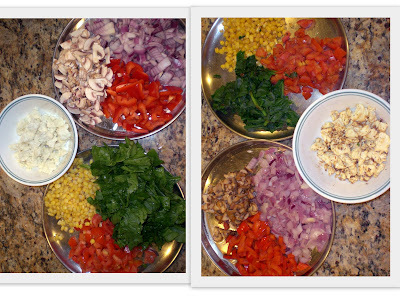 Love & Lentil: Vegetable Medley - Mexican style! It's friday evening - the one day that I so don't feel like cooking. It was a little cloudy and rainy here today. That made my husband call me 3 times from work with suggestions as to what fried food we can make today. There is something so comforting about eating pakodas when its raining. But, I was totally in a different mood today - I wanted mixed vegetables - very light - very summery, springy - whatever you want to call it. I actually wanted a nice cold salad! That's new! never happens! but it did today. Long back I had seen this recipe for spinach and mushroom taco packets. I thought that would be a good thing to try. I can make the fried version for my husband and I can just eat the veggies like a salad! So, here it is - we all actually loved the end result. It was very tasty - even though there were hardly any spices in there. It was just the taste of all the vegetables. Fresh or Frozen corn - I used frozen corn but if you have fresh, use that - its better. Crumbled Paneer - 1 cup; you can use crumble cheese if you have it. I made low-fat paneer and wanted to use that. When all your veggies are cut and ready to go, add them one by one to a pan and saute for just about a min. Fry the onions first, bell pepper next, and then follow with the others with tomatoes being the last. Take care to not saute them for more than 30secs - 1 min. That's all you need. You should still be able to bit into them without having them all mushed up. Add salt and pepper to each of the veggies when you saute them. Use a salt sprinkler so that you don't add too much. Fry the paneer too for a min with salt and pepper- the paneer will also absorb all the juices and flavors remaining in the pan after frying all the veggies. Here are my veggies - before and after. When all the veggies are done, switch off the pan. When the pan is a little cooled down, put all the veggies back in there and toss them up. Add the crumbled up paneer onto it. I served this in three ways. Fried stuff for my husband, plain burrito for my daughter and just as a salad for me! For the fried tortilla pockets, fold a readymade tortilla like a pocket, seal the edges with a little maida paste and deep fry it. Once this is done, fill up the pocket with the veggies. Serve hot. For the burritto, just add the veggies and roll and wrap it up a tortilla. You can also make a bed of tortilla chips and add the veggies on top. Kind of a veggie nachos! Or you could make wonderul veggie quesadillas! Or tacos.. I added a few drops of taco sauce on top of all the above just for to kick it up a notch. That kind of compelted it! It made me think of the saying on top of the hot sauce packets in taco bell - "you complete me"! A good dinner is one that satisfies three different tastes at once. And I acheived it today! I'm feeling victorius having overcome my friday blues. Hey.. too nice provokes me to do it today when it is same weather here in seattle and that too its friday evening. would like to follow ur blog. Hi Kavitha - thanks for stopping by. You are most welcome to become a follower - Seattle is perfect weather anytime for fried pakodas or these types of simple foods!